A well-designed map can be an incredibly valuable tool for healthcare strategy, marketing, and planning. But sometimes, good maps can go bad; and bad maps can easily hurt more than they help. It has been a few years since our last “Bad Maps” post, so let’s have some fun and learn from the cartographic missteps of others! The map below showing US hog density from 1948 is one of my all-time favorite bad maps. Every black dot represents 5,000 hogs, but the cartographer also used black as the background for the page and to outline the border of every state. 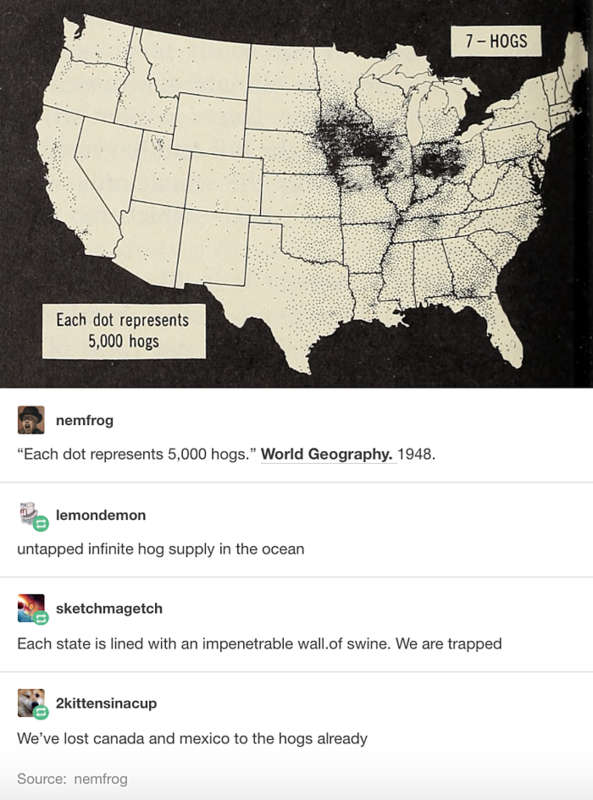 As you can see in the comments below the image, it could be interpreted from this map that our nation is surrounded by a sea of hogs and that each state has a border wall of millions of hogs! Obviously, this was not the intention, but it’s a great example of how an awesomely bad map can take good information, display it very poorly, and cause a lot of confusion. Population density maps are the wolf in sheep’s clothing of the cartographic world. Everyone from mapping novices to professionals who should know better create maps using interesting population variables and trends and these maps often go viral. 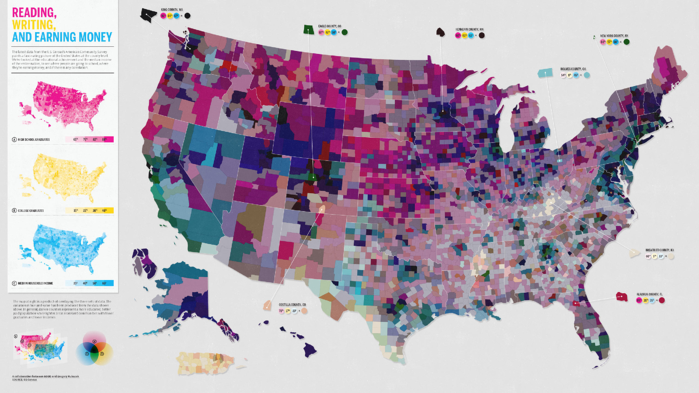 At first glance, these maps look meaningful and provoke thought and fascination. However, these maps are a mirage! 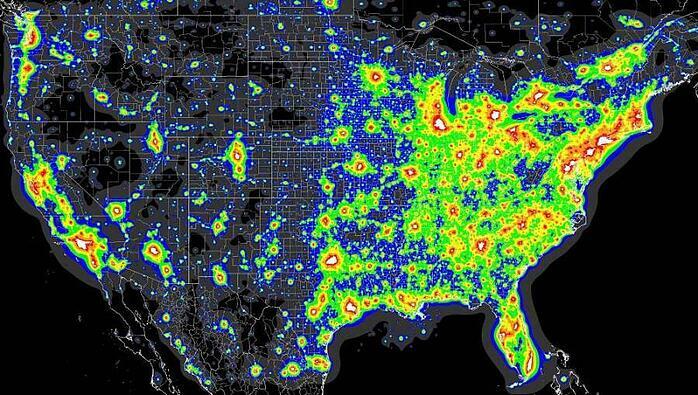 Regardless of the map variables and data used, the population density of the US means there will be more data points where there are more people. Always remember to look at maps objectively and think “Is this just population density?” The giveaway of a population density mirage is the highest concentrations of the variables mapped are in urban areas and the lowest values are in the most sparsely populated parts of the country. These maps all show the same thing and now you’re a pro who can spot the mirage—you know what to look for! You’ll be surprised at how many maps you come across that are population density mirages. Are you able to interpret the information the map below is trying to convey? I sure can’t! This is a perfect example of doing too much. Conceptually, the map makes sense, but its execution is extremely flawed. The three colors for reading, writing, and earning money combine into a muddy unintelligible color-ramp. This means it will take an extremely long amount of time to interpret the results and the map reader has a hard time understanding the message and actionable items. Always remember, with maps, less is more! 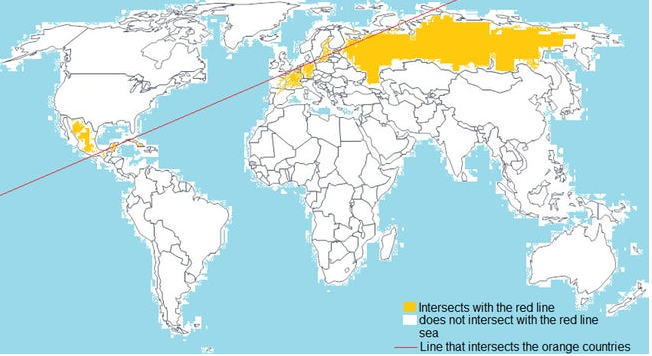 When making a map, keep in mind whether someone with no context or knowledge would be able to understand and interpret it correctly without asking others for help. If they can’t, your map needs to be simplified. The easy fix for the map above would be to create a red, blue, and yellow map. Creating three separate maps would have made for a meaningful series of images rather than the unintelligible, bizarre color wheel we see above. How are people going to be viewing my map? This is an easy question that often goes unasked when maps are being made. Will this map be printed? Will it be black and white or in color? How will it be shared? If you keep these questions in mind, you’ll avoid having a REALLY bad map in the newspaper like the AP did in the image above! Although this map probably looked great using red and blue colors when it was made, the cartographer did not factor in black and white newspaper printing. The result was a map where every state looks the same, which defeats the entire purpose of the map in the first place. 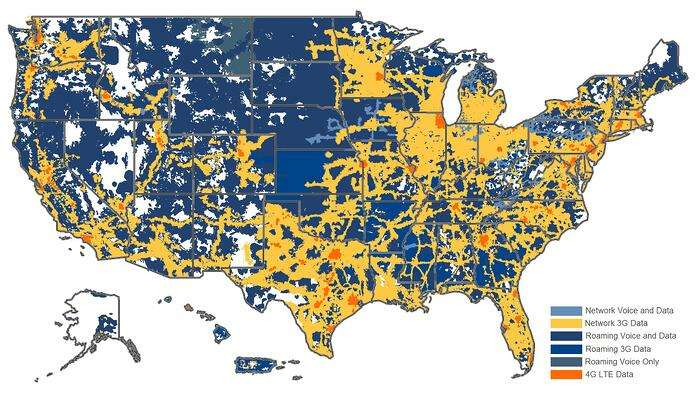 The easy fix for this map would be using grayscale or black/white coloring. By doing that, the map would make sense regardless of the print media used. In an unrelated, but fun, note here is my “Wall of Why?” section: bad maps that make no sense, but are also kind of fun! Why is this map bad? It accomplishes its goal of showing how far away parts of states are from their borders, but it does not present a reason for why this information would be useful. Without presenting a “Why?” with a map like this, it is just an interesting map that doesn’t actually tell the viewer anything of use. 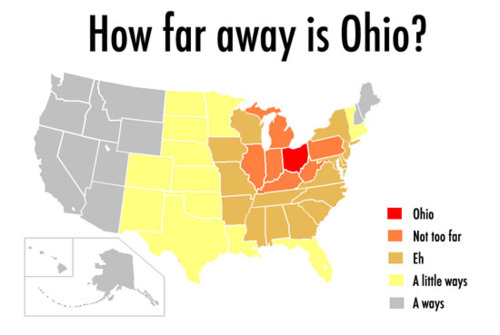 As an Ohio native, I found this map amusing, but that is all it is. The primary reason this map is bad is because the legend/symbology is arbitrary. When you symbolize your maps, you always want the symbologies to be actionable and tell the viewer exactly what they are seeing in no uncertain terms. A classic member of the “Wall of Why,” this map does not serve a purpose. What really makes it bad is the blue and yellow shading. You can tell someone scribbled the fill colors in hastily? If you are going to take the time to make a map, make sure you do it right! Goats vs. Llamas, a battle we never knew existed! 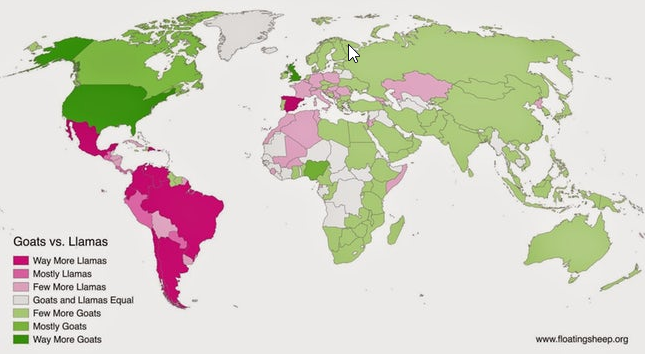 This map is bad because it is both arbitrary (it does not show the actual numbers/proportions of the the animals in each country) and it does not tell us why goats and llamas were selected. Why were cows, sheep, or other livestock were not included as well? Life is too short and your time is too valuable to make decisions based off of bad maps. At Stratasan, we pride ourselves on making our maps as actionable and concise as possible. This map is easy to understand and could be used by anyone within your organization without you having to explain it. The colors are crisp and the map looks good on the computer and when printed in color or black and white. It is not cluttered and draws the viewer’s attention to what is important and does not distract them with what is not. Good maps are simple, but extremely useful! 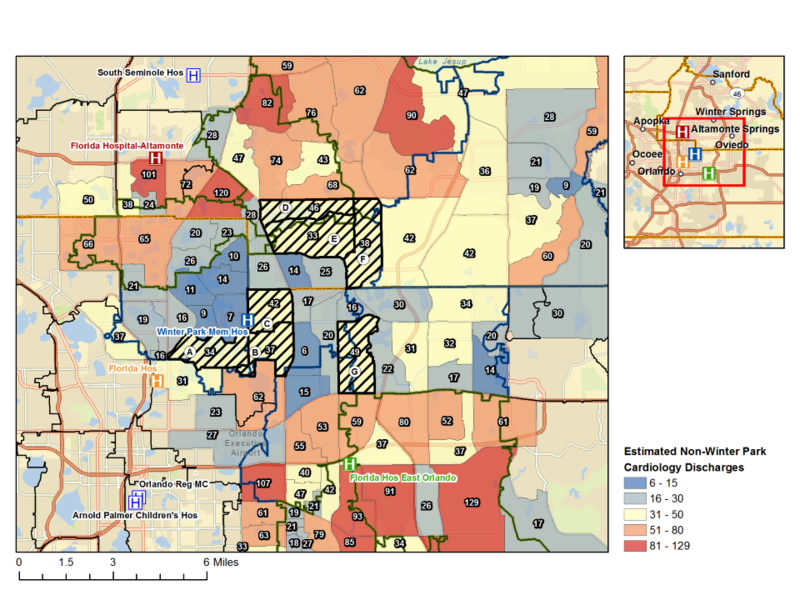 Another example of a good map is this “Estimated Cardiology Visits by Census Tract from Other Facilities” map below. This map is from one of our sample markets. This map looks complex at first glance, but once you look at it, the information is easy to interpret and digest. The red-to-blue color ramp instantly tells the viewer where high concentrations of cardiology discharges are. The labels have the exact number of estimated discharges and the thumbnail at the top-right shows the viewer exactly where they are looking within their larger market. All of these cartographic elements are hallmarks of good maps. Maps are a great tool that can go unappreciated until you have to use a bad one. Hopefully, you’ll now have better luck recognizing bad maps and appreciating good ones after reading this! Stratasan’s goal with our maps since day one has been to provide the best maps with the most helpful cartographic design. This is something we have always done and will continue to do. 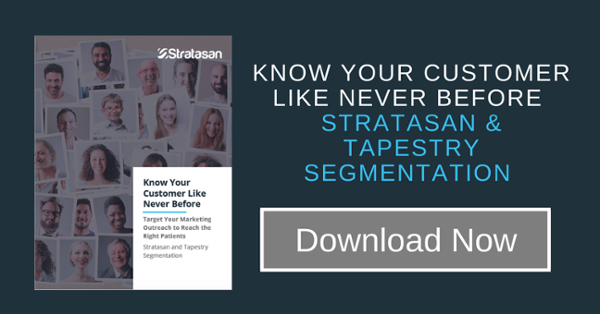 For more information on how you can access Stratasan’s mapping and visualization tools to help your team to make more data-based decisions that can support strategic growth, improve market understanding, and create more effective marketing outreach, contact Sean Conway and schedule a discovery call today.